Samuel Adams Verloren | Drink. Blog. Repeat. I’ve talked before about how I’ve really enjoyed and been impressed by Samuel Adams’ Batch No. 1 series, their run of unique small batch brews that usually steer toward more stuff you wouldn’t expect. Since the series has been a huge hit for me so far, I was excited when I found out they’d be trying their hand at making a gose. I was really impressed with Westbrook’s attempt, and with Sam Adams’ series being full of winners so far, I figured they’d have it in the bag. I was wrong. Verloren, their take on the gose, was underwhelming, verging on the edge of disappointing. The pour is a deep copper orange color. It’s slightly opaque from the chill hazy, but it settles into a crystal-clear deep orange. There were two fingers of a pillowy off-white head that dissipated pretty quickly. The lacing falls off fast, but there were some surprisingly strong alcohol legs. There was a deep mellow orange on the nose, which surprised me. 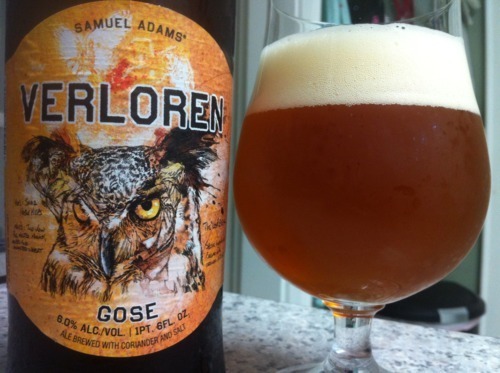 Other goses were very tart and salty smelling due to the coriander, salt and lactobacillus used in the brewing. Verloren was more like a wit or wheat wine as far as its smell goes. There was a bit of spice to it and a nice mellow malt smell, and a slight pine as well. The salt comes through much more prominently as it warms, but it takes a while to show up. Sadly, nothing really stands out on the taste. It’s a little flat and watery on the front. There’s a smooth mouthfeel, but there are no distinctive tastes until the end, when you get a big pop of orange juice at the back coupled with a little spice. There’s only a very small hint of salt toward the back, but it’s barely noticeable as you continue to drink it. The pine comes through slightly on the back as well. I had high hopes Sam Adams would keep their Batch No. 1s in the win column, but this is a big loss for them. When I drink a gose, I want that lip-chapping salt coupled with that tangy and tart taste. This had none of those qualities. I really wanted to like it, but unfortunately, I couldn’t.